In the healthcare industry, “big data analytics” is a term that can encompass nearly everything that is done to a piece of information once it begins its digital life. From flagging drug interactions to predicting sepsis, modeling emergency department use to triggering an automated phone call for a mammogram reminder, healthcare providers are leveraging patient data from the EHR and elsewhere for an astounding array of patient care tasks. But a worrying number of providers continue to struggle to understand just how huge their big data is, not to mention how to collect and use it most effectively. Organizations are all over the map when it comes to their abilities to use healthcare big data analytics for actionable tasks like population health management and care coordination – many providers are still wrestling with how to get basic patient into their EHRs efficiently, let alone forestall a preventable hospital readmission three months down the line. 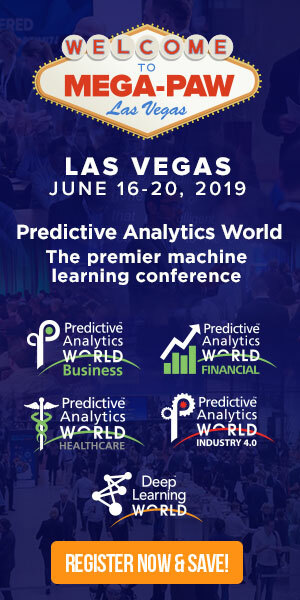 Use code: PATIMES15 for 15% of a two-day Conference pass to Predictive Analytics World for Healthcare. In healthcare, as in many other industries, an organization’s big data analytics capabilities can fall into three major categories: descriptive, predictive, and prescriptive. What do these terms really mean for hospitals and other providers looking to benchmark their analytics progress, and how can they help to guide organizations towards their ultimate data-driven patient care goals? Descriptive analytics: What has happened? In its most basic form, healthcare data only tells you what has already happened. How many patients were admitted to the hospital last July? How many returned within 30 days? How many acquired an infection or suffered from a patient safety mistake? Descriptive analytics is the ability to quantify events and report on them in a human-readable way. It’s the first step in turning big data into actionable insights, and there is a lot to be learned from this level of analytics. Yet this elementary level of reporting still remains out of reach for many organizations. EHR data locked into narrative free-text must be extracted with the help of additional healthcare big data analytics infrastructure, which can be an expensive investment. Proprietary data standards maintain unhelpful silos of information; a lack of available human expertise or proper organizational buy-in can leave data on the table, frozen in incomprehensible zeroes and ones. Predictive analytics: What’s probably going to happen? Organizations that feel they have a sufficiently complete and accurate descriptive analytics program can join the very few healthcare providers who have moved on to predictive analytics: the ability to use descriptive data to forecast what might happen in the future. Predictive analytics is one of the hottest topics in healthcare at the moment as providers seek evidence-based ways to reduce unnecessary costs, take advantage of value-based reimbursements that no longer reward voluminous care, and avoid penalties for failing to control chronic diseases or avoid adverse events that are within their power to prevent. Predictive analytics is so elusive for healthcare organizations because it is so much more than just reading the tea leaves of historical events. It requires access to real-time data that allows nimble decision-making, clinically and financially. That demands a significantly more robust infrastructure than just an EHR. Medical devices must be fully integrated to provide up-to-the-second information on patient vitals to improve safety, while alerts and alarms have to be developed and presented to clinicians without hopelessly disrupting their workflows or annoying them into ignoring critical warnings. Clinical decision support systems that support more accurate diagnoses and treatments must be able to draw on as much patient information as possible, even if that data is contributed through a health information exchange. It is no wonder that providers are struggling to secure sufficient funding to invest in these myriad tools, and continue to face adoption and utilization challenges even if they do. Despite a widespread interest in achieving the promises of predictive analytics, technological roadblocks and competing initiatives have been difficult to overcome while the technology market works to become sufficiently mature. But those organizations that have cleared the initial hurdles of healthcare big data analytics are doing amazing things for patient care and their own financial health. Predictive risk scores that help to prevent suicides, increase watchfulness in the ICU, aid surgeons in their decision-making, and even identify patients whose genes might betray them are becoming increasingly commonplace. Advanced decision support from cognitive computing engines, natural language processing, and free-text analytics can help providers pinpoint diagnoses that might otherwise elude them, while population health management tools for providers and payers can highlight those most at risk of being readmitted to the hospital or developing costly chronic diseases. Predictive analytics may be difficult, but healthcare organizations across the country aren’t letting that stop them from making significant progress with measurable impacts on the lives of patients. The final phase of healthcare big data analytics involves obtaining prescriptive insights. Prescriptive analytics moves beyond the ability just to predict an upcoming event and provides the capability to do something about it. For example, if an organization is experiencing an inordinately high number of hospital-acquired infections, a prescriptive analytics program would not just flag the anomaly and highlight which patients in the ICU may be next on the list due to their vulnerable vitals, but would also automatically identify the particular nurse involved in the care of all these patients who may be spreading the infection and might need to be retrained about hand hygiene. It may also help the hospital develop a more comprehensive antibiotic stewardship program to help prevent similar outbreaks in the future. Prescriptive analytics doesn’t just predict what’s likely to happen, but actively suggests how organizations can best take action to avoid or mitigate a negative circumstance. It requires such a seamless and completely integrated data analytics infrastructure that just a smattering of healthcare organizations have the capability to engage in this ultimate application of data in a large-scale or meaningful way. But prescriptive analytics is the future of healthcare big data, and it’s on its way to becoming a reality. As the Internet of Things creates a new way of looking at health information and machine learning advances and algorithms become almost unnervingly sophisticated in their ability to calculate the behaviors of nearly everything, from consumers choosing products at the grocery store to the minute movements of the stock market, the healthcare industry has an enormous opportunity to take advantage of these decision-making abilities. The future of prescriptive analytics is nearly unlimited in its scope and depth as developers dream up the technologies of the future. While too many healthcare providers are still trying to claw their way out of locked rooms of unusable EHR data, an industry-wide push towards viewing healthcare big data analytics as the answer to so many critical questions is accelerating the development of an infrastructure capable of becoming the foundation for prescriptive analytics and truly meaningful advances in the quality, timeliness, and effectiveness of patient care.